The feature count display shows how many features passed through each link. The display continuously updates as features pass through the workspace. This function helps analyze the results of a workspace, and provides a reference for debugging if the destination results or performance are not what you expected. Feature counts are also written to the Log file but you can find the references more quickly on the links in a workspace. To enable feature count display, click the Enable/Disable Feature Count Display tool on the Toolbar or set Display Feature Counts in Tools > FME Options > Translation, under General. Note: Enabling feature count display may cause a small decline in performance of translations. In this example, you can see that 26 features entered the transformer and that only one of the features passed the test criteria. 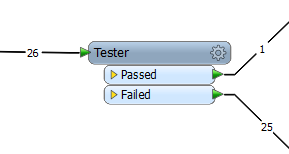 When feature count display is enabled, you can also see the number of features that are output through the <Rejected> port of a transformer, and view those features in FME Data Inspector. For more information, see Viewing Rejected Features.